Shashi Tharoor has called out moral policing by right-wing activists on Valentine's Day in the past too. Congress leader Shashi Tharoor provoked criticism today with a Valentine Day tweet targeting "Sangh Parivar trolls" for moral policing. Those facing threats for being seen with their friends on Valentine's day can simply try another name, he suggests. "Happy #ValentinesDay. If any Sangh Parivar trolls try to threaten you for being out with a friend, tell them you are celebrating the ancient Indian tradition of #KamadevaDivas," he said in a cheeky tweet. Union Minister Mukhtar Abbas Naqvi responded to Shashi Tharoor's comments, disparagingly calling him "love guru". "Shashi Tharoor is a love guru. Now if anyone protests against Valentine's Day, the love guru will obviously go after them," Mr Naqvi told news agency ANI. Mr Tharoor was taking a swipe at right-wing activists who are prone to threaten -- even manhandle -- couples on Valentine's Day. Last year, 10 activists of the Vishwa Hindu Parishad or VHP and its affiliate Bajrang Dal were detained in Ahmadabad for allegedly trying to chase away young couples at the city's Sabarmati Riverfront. Mr Tharoor has called out moral policing by right-wing activists on Valentine's Day in the past too. "Maybe the BJP government, with its fondness for rebaptizing Government schemes with new Sanskrit appellations, should give serious thought to just calling Valentine's Day Kamadeva Divas. 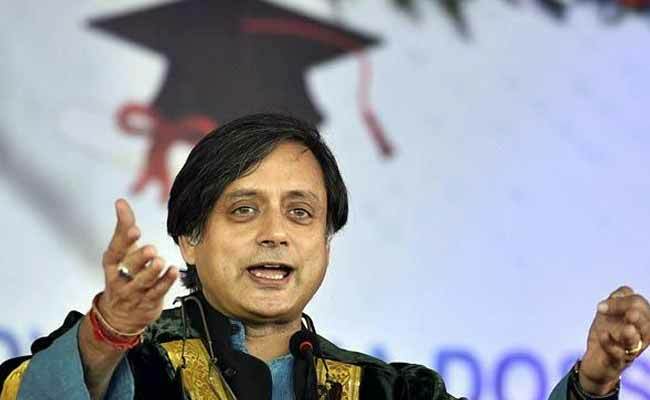 Then the Hindu Mahasabha could be given a few ancient texts and told to rediscover the glories of their own ancient culture," Mr Tharoor had said in a column for NDTV. Kamadeva is the Hindu god of love and according to ancient texts, the son of Vishnu and Lakshmi, who was turned to ashes by Lord Shiva.